Every Easter, my family would get together for the long weekend. We would usually go to my aunt Renata’s weekend house in Indaiatuba on Thursday – which is a 45 min drive from São Paulo – and stay there until Sunday. It was usually 20 of us: grandparents, parents, brother, aunts, uncles and cousins! A lovely weekend full of love, laughter, good food and amazing drinks! We also exchanged gifts: huge chocolate eggs with surprises inside, which are very popular in Brazil. Why do I talk about it using the past tense? Because I now live in the US and unfortunately don’t participate in that anymore… But they still do it! In fact, they are doing it right now and they keep sending pictures to torture me. So how can I get back to them? 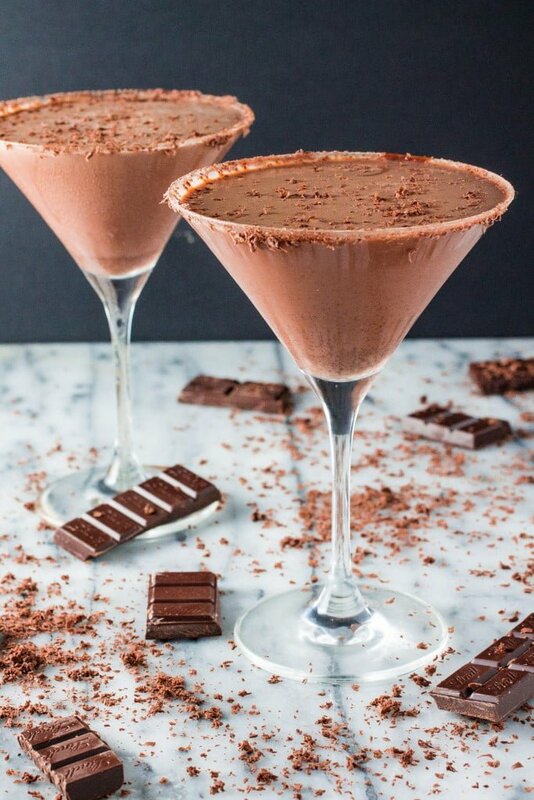 I can only think of one thing: Chocolate Martini. I’m sure at least my dad will be jealous of this drink! Every time he sees me, he looks at me with his sad puppy eyes and asks me to make a “Martini do Clint”, which translates to “Clint’s Martini”. It is only a plain regular gin martini, but since he remembers seeing Clint Eastwood drinking it in one of his movies, that’s how he jokingly refers to it. 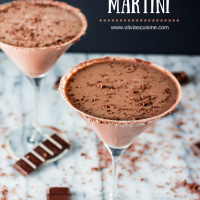 I know a Chocolate Martini is no Martini for a real Martini drinker, but I’m sure he would make an exception for a delicious Easter cocktail! Especially if it involves chocolate! 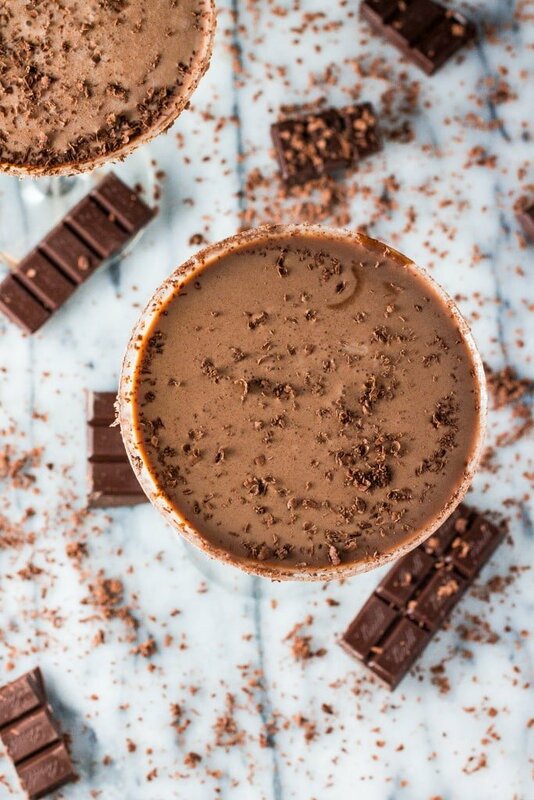 If you had or made a Chocolate Martini before, chances are your recipe was slightly or completely different than this one. Many use chocolate liqueur for the “chocolate” part of the cocktail, especially at bars. 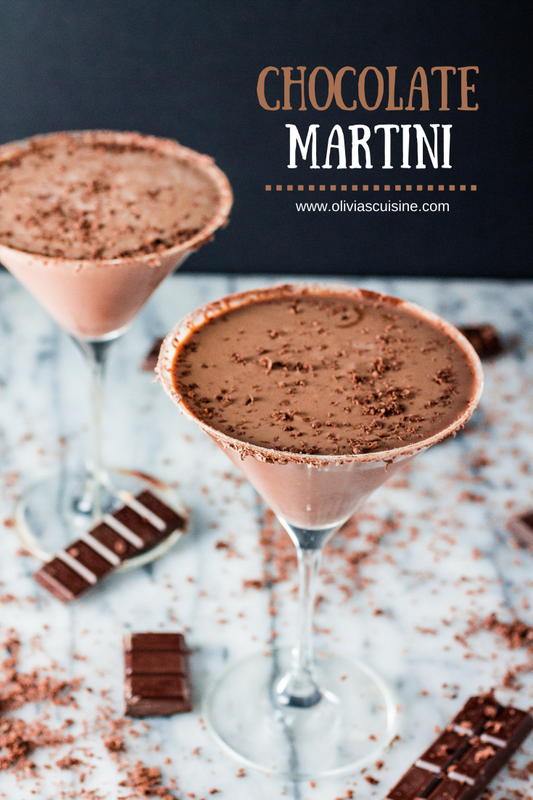 I prefer to use chocolate ganache because I like my Chocolate Martini very creamy and decadent. This cocktail could easily substitute dessert. But since it’s Easter, let’s have both, shall we? Now that I think of it, I realize I don’t share enough cocktail recipes here at the blog, which is odd considering I’m a bartender (I prefer mixologist! lol). I think it’s because I usually don’t drink that much… My heavy drinking phase is long gone – I left it in my twenties! – and nowadays I mostly drink wine. My cocktail shaker is usually gathering dust in the cabinet, which is a shame, because I could be doing so many delightful cocktails with it. If only I had a normal schedule and a group of friends that I could invite for dinner parties. Ooh, I would be creating new cocktails every week! This drink isn’t really supposed to be a “Let’s get hammered!” cocktail, but feel free to customize the amount of alcohol to your liking. If you don’t know how to measure shots, I recommend you get a pourer for your bottles. They are quite inexpensive and you can find them online. The rule is 1 ounce = a 4 second pour. So if the recipe asks for 0.5 ounce shot vodka, that means a 2 second shot, and 2 ounces Baileys means an 8 second shot! If that’s too complicated, just use a shot glass. Usually the small shot glasses are 1 ounce of liquor! Oh my gosh this is gorgeous!!! I would love it if you link it to Tipsy Tuesday at Grey is the New Black!! Hi I loved your talk before making the drink. I normally don’t read cause most people are so wordy but your personality came through! Thanks going to try it soon!